The concept of the Incomplete Measure often causes confusion with our Students. 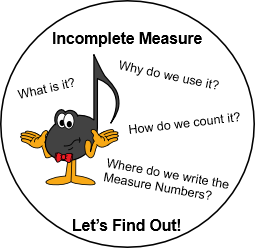 What is an Incomplete Measure? Why do we start music with an Incomplete Measure? How do we count the measures in a piece when it starts with an Incomplete Measure? Where do we write the Measure Number for an Incomplete Measure? In this Incomplete Measure Blog, we will look at some Easy Tips (and answers to those questions!) to making Incomplete Measures easy to understand! Incomplete Measure - What Is It? A Measure is a unit of music. It is the space (area of music) between two bar lines. The Time Signature (the 2 numbers at the beginning of the melody) indicates how many beats are in a Measure. The Ultimate Music Theory Prep 1 Rudiments Workbook introduces Bar Lines and Measures on Page 32. 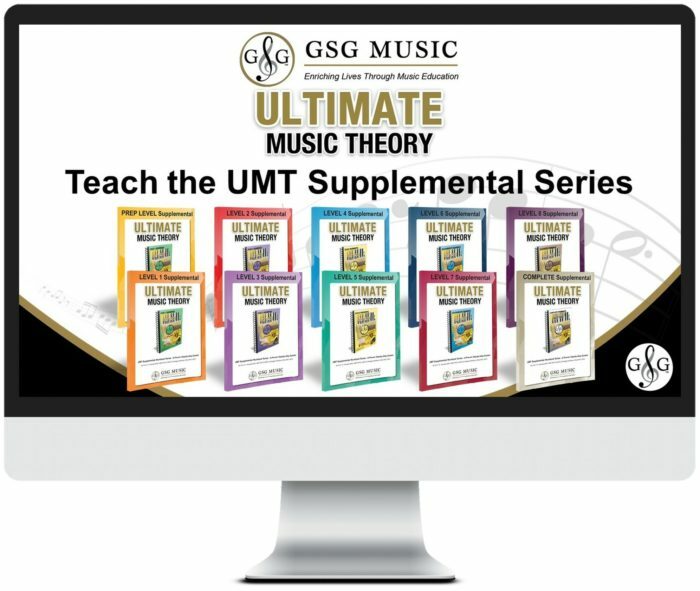 The Ultimate Music Theory Basic Rudiments Workbook introduces Measures and Measure Numbers on Page 13. 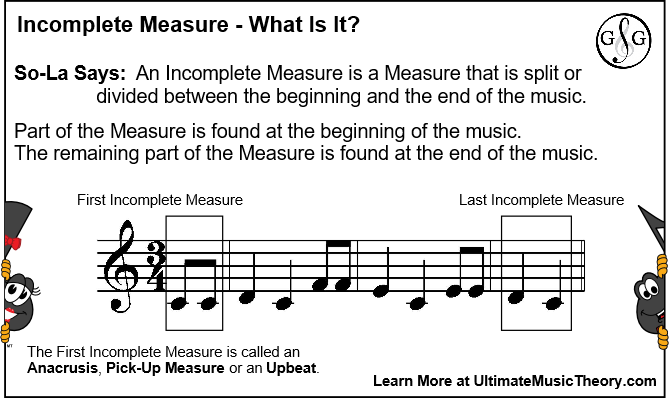 A First Measure is called an Incomplete Measure when it does not contain the full number of beats as indicated by the Time Signature. An Incomplete Measure simply occurs when PART of the counts are at the beginning of the music and the OTHER PART of the counts are at the end of the music. The two "parts" must add up to one complete (full) measure. In the UMT Basic Rudiments Workbook, the Incomplete Measure is introduced on Page 104. The notes in the first Incomplete Measure (the part of the counts found at the beginning of the music) are called the Anacrusis, Pick-Up or Upbeat. I have not discovered (yet) if there is a name for the notes in the final/last Incomplete Measure. I will let you know if I do! Incomplete Measure - How Do we Count Them? 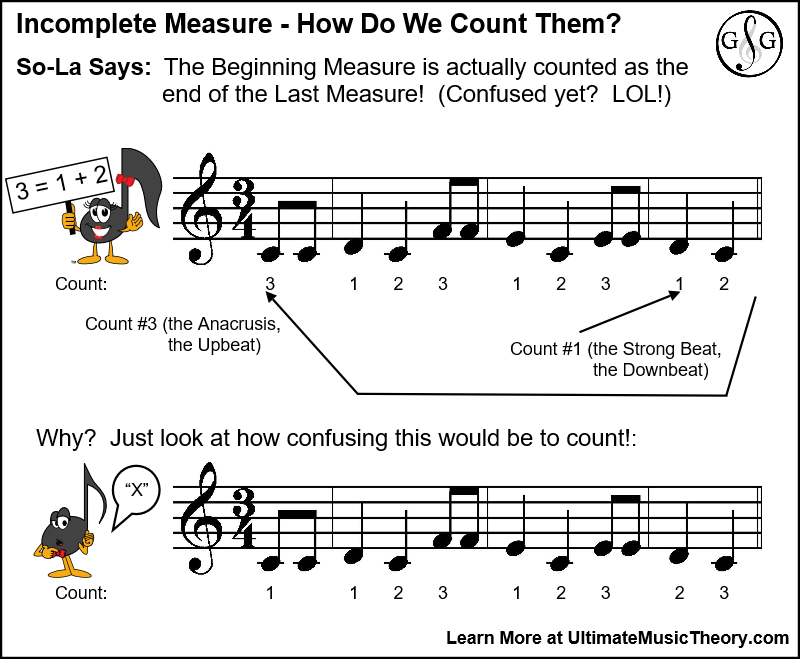 When a melody starts with an Incomplete Measure, it does NOT start with Count #1! Count #1 is the first count of the first Complete Measure. It is not necessarily the first count of the melody. So, how is the first count of an Incomplete Measure? To figure this out, you must go to the end, to the Last Measure! The beginning of the final measure will be Count #1. So, start adding the counts there and, when you run out of beats, head back to the beginning and finish adding the counts. On Page 104 of the Ultimate Music Theory Basic Rudiments Workbook, there is an excellent exercise on how to add the counts when a melody does not start with a complete measure (when it does not start on count #1). I tell my Students that if they start counting with Count #1, but they run out of notes to write counts under, then it is an Anacrusis and they need to go to the end. The final measure will start with Count #1. Start adding the counts there and, when they run out of notes to write counts under, they get to head back to the beginning to finish the counting. Incomplete Measure - Why Do we Have Them? Why do we use an Incomplete Measure? Quite simply, it is all about the Beat and the Pulse. Trying singing "Happy Birthday" but start with a Strong Downbeat (Strong Pulse) instead of with a weak Upbeat (weak Pulse). It just does not sound correct, does it? How about singing "Amazing Grace" starting with that Strong Downbeat (Strong Pulse) on the "A" of "Amazing" (instead of beginning with an Incomplete Measure so that the Strong Downbeat is on the "MA" of "aMAzing"). It simply does not work! And THAT is why we use an Incomplete Measure. In the Ultimate Music Theory LEVEL 4 Supplemental Workbook on Pages 34, 35 and 36, Students learn how to Conduct in Duple, Triple and Quadruple Time. Read, Sing or Play the 2 Melodies in the Example Box here. Use one hand to Conduct in Triple Time, with a nice strong Pulse on the Downbeat (1). Which works? Incomplete Measure Numbers - Where Do We Write Them? The important tip to remember is that Measure #1 is the first measure that has Count #1! The first Measure may not be Measure #1. If there is no Count #1 at the beginning of that measure, then it is an Incomplete Measure. The Anacrusis, Upbeat or first Incomplete Measure will not have a Measure Number. It is considered part of the final Measure (the last Incomplete Measure) when counting Measures. So, while it looks like there are 4 "measures" in this melody, there are only 3 "Complete" measures. If we were to put a repeat sign at the end of this melody, then student would play that "Complete" Measure #3. Measure #1 is the first measure with Count #1. 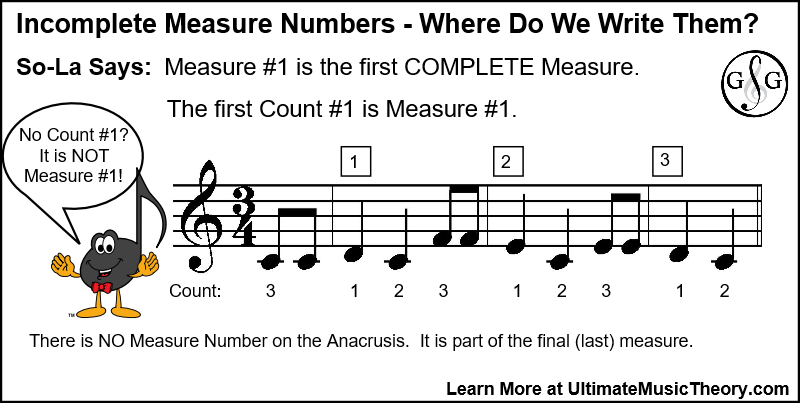 The Anacrusis (incomplete measure at the beginning of a melody) does not have a Measure Number. It is part of the final measure (the incomplete measure at the end of the melody). Counting is a MUST! Help your students to count aloud, using a louder/stronger voice on each "1". Music is alive, it is vibrant, it has a Pulse. Find it and Feel it! Theory is the Foundation of Music. 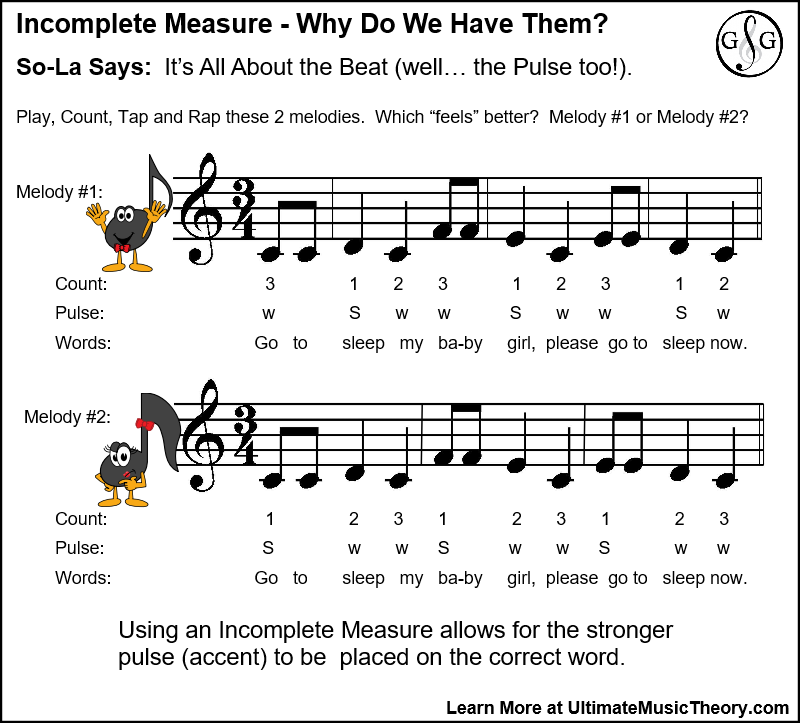 Now that you have tips to understanding an Incomplete Measure, helping your students to play or write music that does not start on Count #1 is easy! Have fun! Love the answers to the what, why and how questions on the Incomplete Measure. Thanks Shelagh!